Fees associated with the Kazakhstani PCT national phase entry as well as other patent fees are available in the fee calculator. The term for entering the PCT national stage in Kazakhstan is 31 months from the priority date. The restoration of this term is possible within two months from the lapsed term. To obtain a filing date, it is necessary to provide the National Institute of Intellectual Property with the request to grant a patent and international application materials. The official languages of the Kazakh patent application are Russian and Kazakh. The international application may enter the Kazakh PCT national phase in the original language; however, the translation into Kazakh or Russian must be provided within two months from the Kazakhstani PCT national phase entry. The Power of Attorney may be provided simultaneously with entering the PCT national phase or within two months from the filing of the application. Legalization or notarization is not required. The request to conduct the substantive examination, as well as the payment of the examination fee, should be submitted to the Kazakhstani patent office within three months from the notification about positive results of the formal examination. The restoration of this term is possible within 12 months from the lapsed term. The official fees for grant and publication should be paid within three months from the date of issuance the decision to grant a patent. The annual fee for maintaining the Kazakhstani patent validity must be paid for each year of its validity, beginning from the date of filing of the application. The first annuities may be paid simultaneously with the official fees for grant and publication or within two months from the publication of the patent. Foreigners must appoint a registered Kazakh patent attorney to perform the national phase entry of PCT application in Kazakhstan. 1. Online Search databases: Kazakh Patents and Utility Models, Eurasian patents (EAPO). 2. 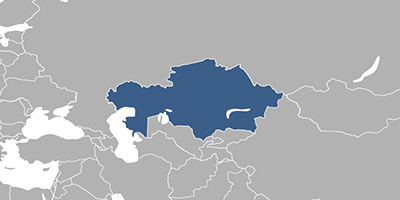 The PCT application may also be nationalised in Kazakhstan via entering the Eurasian regional phase of PCT application. 3. Entering the PCT national phase in Kazakhstan as a utility model is possible.